The annual Golden Globes awards recently came and went without a single win for one of the old line Big Four broadcast networks -- ABC, CBS, Fox and NBC. It was the same story at last September’s televised prime-time Emmy Awards ceremony. ABC, CBS, Fox and NBC again all came up empty. Furthermore, who binge-watches any of their programs anymore? If you’re looking to do that, you’re mostly looking at Netflix, Amazon or Hulu. Or those cable networks that still pride themselves on turning out quality scripted series: HBO, Showtime, FX, AMC and the like. The answer seems to be getting clearer by the day. ABC, CBS, Fox and NBC exponentially are betting their futures on unscripted “reality-competition” programming, which is appreciably cheaper to produce and already has provided loads of profitable long-distance runners. For the most part, the broadcast networks are still better at the reality-competition game than their cable or streaming competitors. CBS already has three such series that seemingly have been on forever. Survivor, Big Brother and The Amazing Race all keep paying dividends. But when talking about this genre, let’s not forget the ultimate reality-competition attraction. That would be the NFL, whose ratings roared again this season after falloffs in recent years. You want unscripted reality-competition drama? Sunday’s NFC and AFC championship games, both of which went into overtime, had more genuine twists, turns and controversies than all of Bravo’s Real Housewives franchises combined. Fox basked in muscular ratings for the Los Angeles Rams-New Orleans Saints matchup while CBS did even better with the later game, the New England Patriots vs. the Kansas City Chiefs. And during the regular season, NBC’s Sunday Night Football remains a prime-time ratings monster. Now CBS gets the Super Bowl on Sunday, Feb. 3rd. And for the first time since NBC deployed The Voice in 2012, CBS’ post-Supie attraction will be a reality-competition show. Namely The World’s Best. 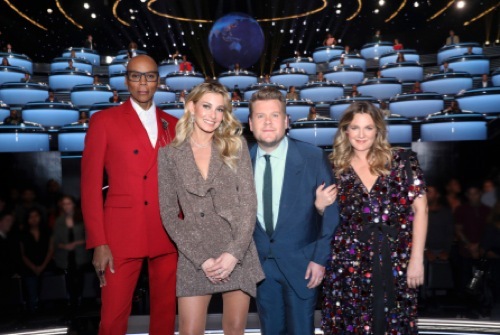 Billed as a “one-of-a-kind global talent competition series,” it’s hosted by James Corden, with judges Drew Barrymore, RuPaul Charles and Faith Hill. But that’s just the American contingent. Those competing for a $1 million grand prize also will need to “break through the ‘Wall of the World,’ which consists of 50 “accomplished experts from every field of entertainment.” The show then will move to Wednesdays, starting on Feb. 6th. CBS also is banking heavily on -- and heavily promoting -- its second installment of Big Brother: Celebrity Edition, which premiered on the Martin Luther King Jr. holiday and features another former member of President Trump’s inner circle, Anthony “The Mooch” Scaramucci. Last year’s BB: Celebrity Edition included houseguest Omarosa Manigault-Newman, whose early tattles about her former boss were also juicy fodder for the three cable news channels. CBS has two other new realilty-competition series in development. Love Island is exactly what it sounds like while Million Dollar Mile is an obstacle course showdown from LeBron James’ production company. Over on Fox, The Masked Singer continues to be the network’s biggest midseason hit despite its imbecilic premise. The network also has a profitable fistful of long-running Gordon Ramsay cooking competitions and is resurrecting Paradise Hotel, which originally debuted in 2003 on Fox. And coming on Feb. 26th is Mental Samurai, with host Rob Lowe. It’s touted as “the first-ever obstacle course for the mind.” Yeah, I’ll bet. Much of NBC’s midseason promotional energy has been devoted to a trio of reality-competition series -- Ellen’s Game of Games, Dwayne “The Rock” Johnson’s Titan Games and the tricked up America’s Got Talent: Champions. NBC also is home base for The Voice, The Wall, World of Dance, Little Big Shots, Hollywood Game Night, Making It and American Ninja Warrior. Yet another talent competition series, Songland, is being developed by the producers of The Voice. ABC, best known on the reality-competition front for The Bachelor and numerous spinoffs, will offer up a second season of its American Idol reboot on March 3rd. Dancing with the Stars is scheduled to give it another whirl next fall while ABC continues to be home to Shark Tank and a big helping of game show revivals ranging from Celebrity Family Feud to The $100,000 Pyramid. The NBA Finals also sill belong to ABC. And demographically speaking, they’re the best pro sports scorer, percentage-wise, among advertiser-coveted 18-to-49-year-olds. Whether it’s athletes in action or concocted competitions, shows in this genre also can fill multi-nights and multi-hours of prime-time real estate per week. Increasingly they’re the way to go for ABC, CBS, Fox and NBC. None of them are in any danger of winning any prestigious awards beyond a lone, silly Emmy category created in 2003. But when you’re fighting for your lives, that’s basically beside the point.